Some trunks, like the 12 million recalled Lane cedar chests (above), can lock automatically upon closing and only be opened from the outside. As much as an old trunk or hope chest can look nice in your living room, it can also be a potential hazard for children if there is no way to open it from the inside. 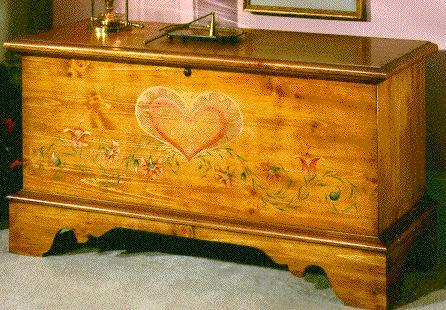 Yesterday, a young brother and sister in Massachusetts died at their home after becoming trapped inside a hope chest in their home. According to the AP, the siblings appear to have become trapped inside the chest with a lid that could only be opened from the outside. Authorities say there were multiple family members, including at least one adult, in the house at the time and that the chest was located next to a TV set with the volume turned up. It appears that the deaths are accidental. While there are manufacturers’ standards for toy chests, older products and some cargo trunks may still be able to inadvertently trap someone inside. Look at any chests you have sitting around the house. Even something with a simple hasp latch that would require a padlock to keep someone from getting in may be enough to prevent a small trapped child from getting out. You can usually remove such latches without much trouble. Or you could put a childproof lock on the latch so that the chest can’t be opened in the first place. Trunks and chests with latches that can’t be opened from the inside should never be used as toy chests and should generally be kept away from areas where children play. Back in 1996, Lane furniture and the Consumer Product Safety Commission recalled some 12 million cedar chests following the deaths of six children. Even after the mass recall, a number of the trunks remained in consumers’ homes, leading to another suffocation death and at least two additional near-fatalities.